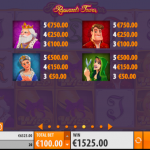 Rapunzel’s Tower is another video slot game from Quickspin that was inspired by a famous fairy tale story. At the beginning of the game you can see the princess` long hair trapped in a tower. So, your task is very easy here, you only need to save the princess and grab all the wins. The sound effects are discreet and they perfectly match the theme. There are a couple of features in Rapunzel’s Tower that make the game play more interesting. First we have the Respin Wild where we need the wilds with Rapunzel`s hair. This symbol appears on the second, third and the fourth reel and when they do, they will remain in place and award you with respins until you land a win. The main feature in this game is the Rapunzel’s Tower game. Namely, you need to land 3 tower symbols to trigger the bonus game. You will receive 10 free spins and the idea here is to win as much money as possible and to help the prince climb up the tower. Every time the Rapunzel`s hair symbol appears on the reels you will move one step up the tower. The idea is to reach the tower and at the end you will receive x2 multiplier. On the way up it is also possible to land some more symbols. Rapunzel’s Tower is a very interesting game. 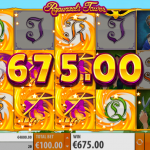 But then again this is a slot that was produced by the crafty hands of Quickspin software, so we would not expect anything less. The game play is interesting and the story line makes the experience more thrilling especially when you activate a feature. The betting options are wide so every kind of a player will be happy to find the perfect bet size for them. 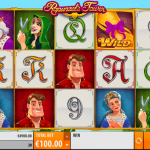 For an adventure taking you back to medieval England consider playing Mighty Arthur a 5 reels slot by Quickspin.